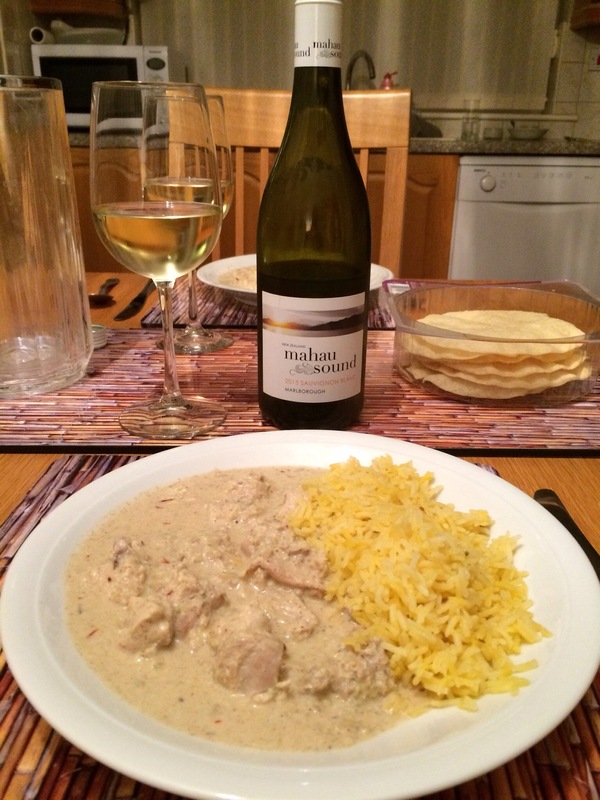 We cooked Chicken Curry with a Cashew-Coconut Sauce, a Sri Lankan dish from Madhur Jaffrey. 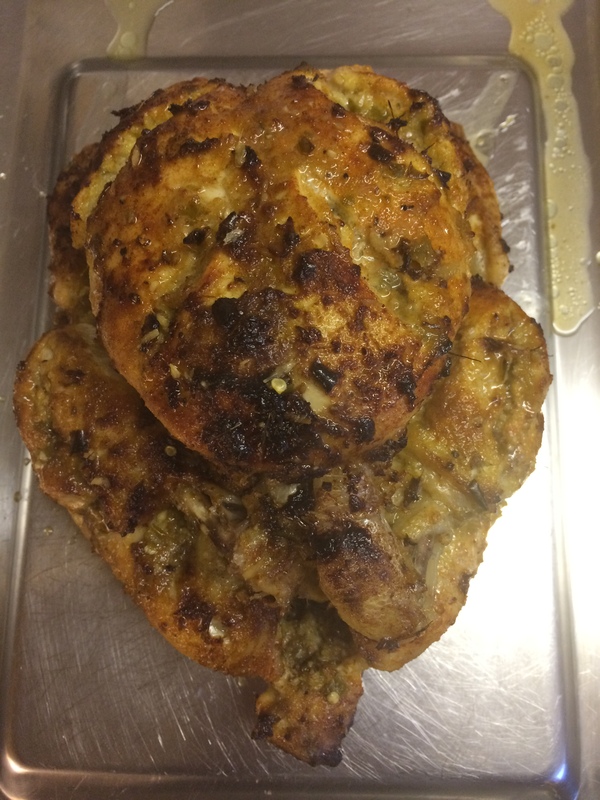 Chicken pieces are rubbed with coriander, cumin, fennel, cayenne pepper and salt. A little rice is fried with coconut and then ground with cardamon pods, cloves and cashew nuts. Water is then added to make a paste. The chicken pieces are cooked with cinnamon, fenugreek, shallots, garlic, tomatoes, water and pandanus leaf. (We cannot buy this locally, so we used a bay leaf and some dried basil). 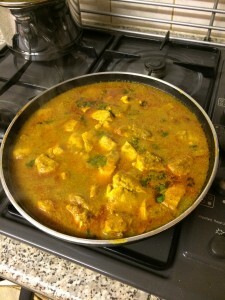 The spice paste is added and also coconut milk towards the end of cooking. We served the curry with rice. We decided on a bottle of Peter & Peter Riesling 2013, a German white wine from Tesco. 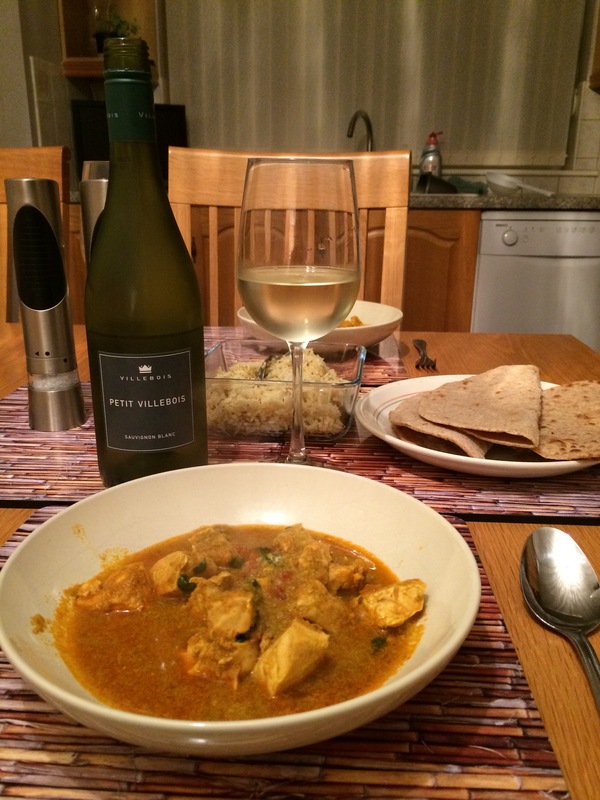 This was slightly off-dry, with creamy, tangy lemon and melon flavours and was a good match. The following day we had the leftovers and tried a bottle of Hunter’s Sauvignon Blanc, a New Zealand white from Sunday Times Wine Club. 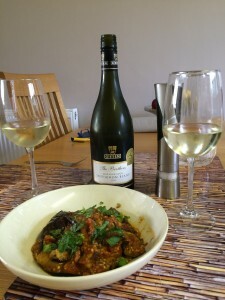 A superb wine, but it didn’t work with the food, so we set it aside. 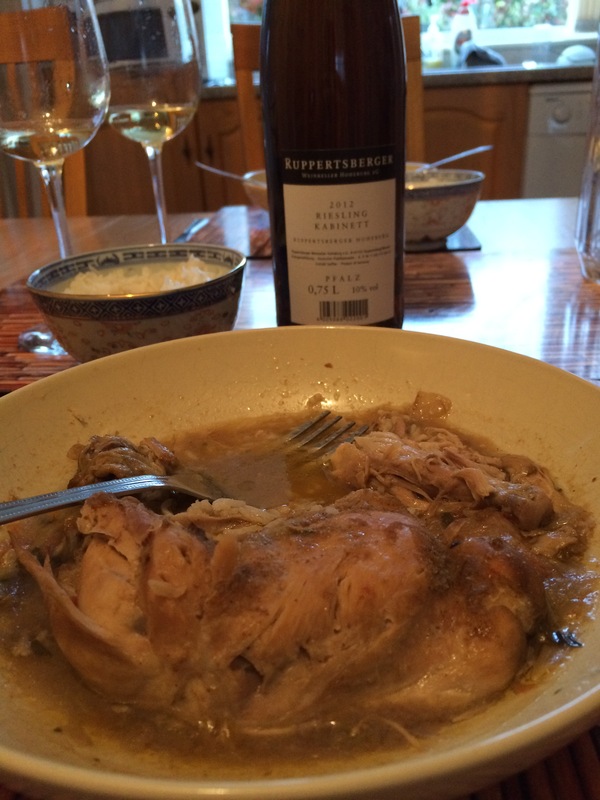 We returned to a Riesling and this time opened a bottle of Ruppertsburger 2012 Riesling Kabinett, a German white from the Wine Society. There was some sweetness, a creamy smoothness, with citrus fruit flavours, minerality and a slightly tangy, but sweet finish with pineapple hints. A very good wine and a much better match than the Peter & Peter Riesling. 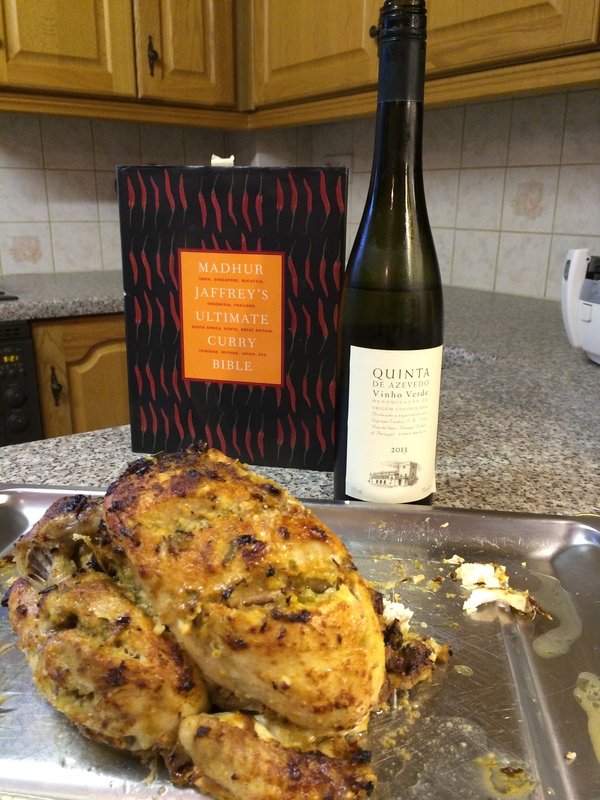 We were looking for a recipe to pair with a slightly off-dry Riesling and decided on Amy’s Spicy Nyonya Chicken, a Malaysian dish from Rick Stein’s Far Eastern Odyssey. 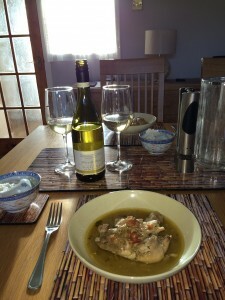 Chicken pieces are simmered in water with lemongrass, kaffir lime leaves and a spice paste of Kashmiri chillies, shallots, lemongrass, garlic, shrimp paste and ginger. Lime juice and palm sugar are added at the end. We served with Jasmine rice. 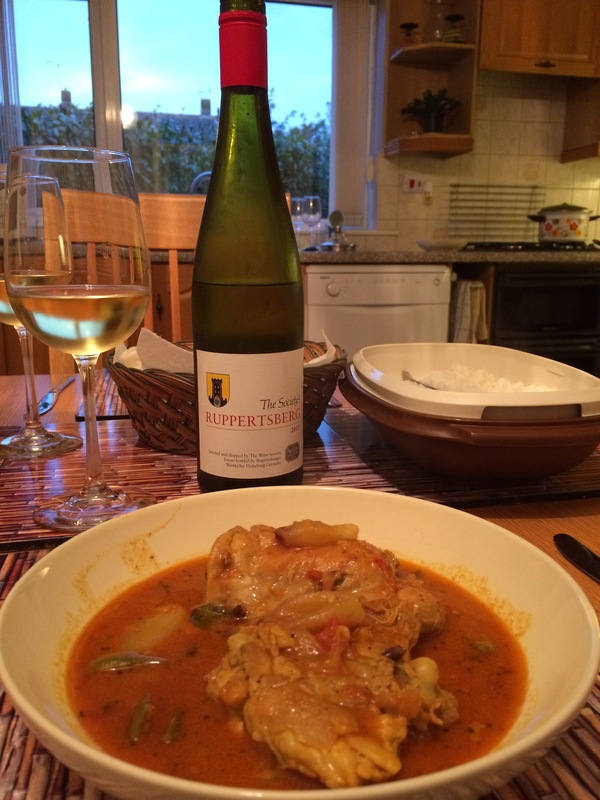 We paired the meal with a bottle of Peter and Peter Riesling aus der Steillage 2013, an off-dry German white from Tesco. 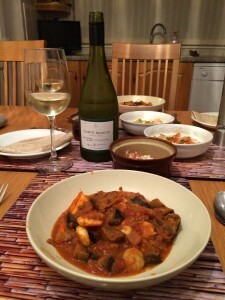 We have not been successful in finding good pairings for this wine previously as can be seen here and here. 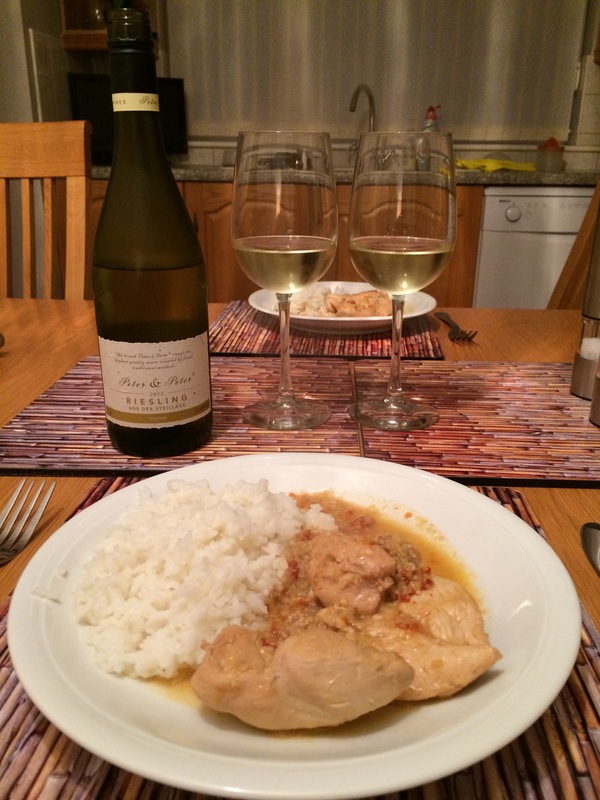 However, we thought the wine’s tropical and citrus fruits with a slight sweetness went well with the meal. A good match at last.